People choose to get married at Esperanza Resort because they fall in love with the resort's grounds and views. It is one of the prettiest resorts in Los Cabos, and everyone should enjoy the resort's signature drink (a Cabo Green Margarita) while watching a Mexican sunset from its pool deck. 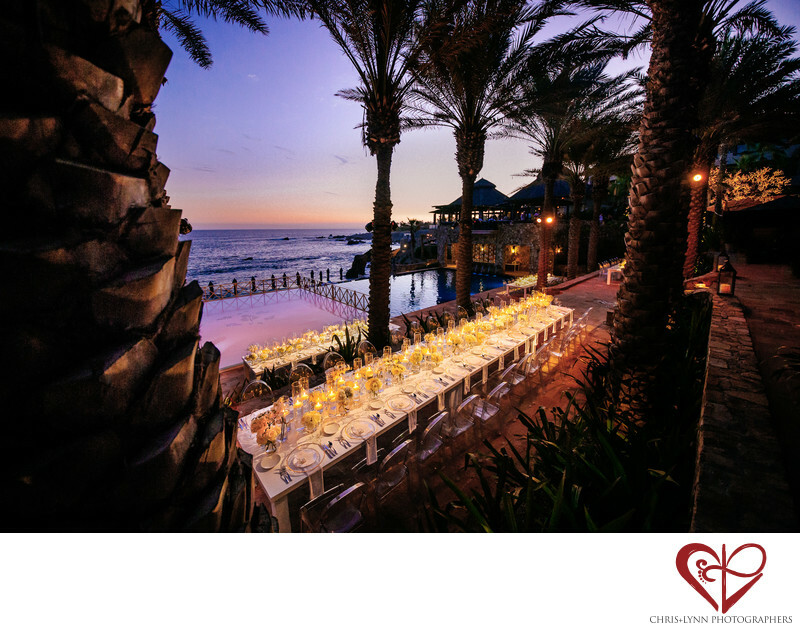 Lush with mature date palm trees and overlooking the ocean, the location is the choice for many couples' reception dinners and parties. For this wedding, the pool itself was covered by a gold-etched white dance floor, and guests enjoyed dinner at tiered tables softly lit with candles. The effect as the sun set was simply magical. Couples love to have images like this to get the sense of what their guests experienced when they entered the reception at the beginning of the night. So many decisions came into play to make this tablescape design - the lucite chairs, the number of candles, the location of the tables, the types of floral arrangements - many of which the bride spent hours contemplating. The lighting design here also really creates the mood of romance. While many couples think of lighting design as an afterthought, it is actually one of the most important elements in setting the scene and the vibe of the reception. Whether you use paper lanterns, chandeliers, uplighting, swaged lights and fabric, gobos, spotlights, or hanging lamps, using lighting elements in your reception design also creates impact in your photos. 1/60; f/4.5; ISO 1600; 12.0 mm.